Hatyai is always a popular short getaway destination for Malaysians especially Penangites for its close distance. The journey from Penang to Hatyai takes approximately 4 hours depending on the crowd at the immigration. The queue at the immigration could take up to as long as 2-3 hours hence it would be not be very advisable to visit Hatyai during festive holidays (unless you don't mind the massive jam). The best way to travel in Hatyai would be by car, rented van or local tuk tuk. During my recent visit to Hatyai, I got to sample some good and really cheap authentic local food, which is not known by tourists (yet). Here are the 8 places that you should definitely try out when you are in Hatyai next time! * Please take note I do not have names for the restaurants as they are all in Thai (because they are local spots! ), hence I will provide landmarks nearby, along with Google Map coordination or link to assist you. Our first food stop was right after clearing custom at Sadao Immigration. For those who are already starving during the long journey, this is a good place to stop for a quick meal. Follow along the road and look for a big yellow tyre shop called Cockpit on your left. Turn into the street right before Cockpit and you will see a small eatery on your right. Opposite the shop is a sheltered hut for customers to dine in. We ordered 3 noodle dishes to share and I enjoyed the Suki (Thai tang soon) the most for its tanginess and spiciness. Address: Samna Kham, Sadao District, Songkhla 90320, Thailand. I bet you wouldn't even notice this place if I didn't tell you. This place is easily unnoticed as it is located in a very narrow lane. Again, I do not have the name of the place as I don't understand Thai but I could give you a simple direction to find this place. It is situated opposite Hatyai Hospital and right beside Watson (on the left if you are facing Watson). When you see a narrow lane with a blue sign that seemingly leads to no where, that's the place you are looking for. Who would have expected to find good food there?! See how narrow this lane is!? "Zhu char" is a hokkien term which means a Chinese stall (usually non air-conditioned) that provides a wide variety of affordable home cooked dishes that go along with rice. Here in Hatyai, we found a really good Thai style "zhu char", every dish we ordered were delicious! This place is popular among the locals based on the queue that was formed during dinner hours. And the price is really affordable! 5 delicious dishes for only THB400, wow! I really love this dish and it's really spicy! Two kinds deep fried pork is their signature dish - must order! This is so good! Kim Yong Market is popular among the locals as well as tourists. After an early morning prayer (6:30AM) at Kim Yong Market, we proceeded to one of the coffee shops to have our breakfast. If you are an early and would like to have pork leg rice or chicken rice as your breakfast, this is one of the good options. One of my favourite during the entire trip! We tried both dry and soup koay teow and definitely loved it! Other than its hearty portion, the pork broth that comes along with the dry koay teow was sweet and tasty, the tom yam soup koay teow was delicious as well. You also have the option to add on duck egg to your noodles or get a packet of those pork skin and dip in the soup. Sinful I know but so good! Highly recommended! Deep fried pork skin - sinful but yummy! I name this the 'power' roast pork. The fragrance and crispiness of the roast pork skin make you ask for more! If you love roast pork / siu yuk, look no further! I also like the accompanied sweet sauce which adds a little tanginess to the whole dish. Their char siew was ordinary and nothing to shout about but I'd definitely go back for its roast pork! Make sure you come early before it is sold out usually around 3-4pm. Pork satay is considered as a luxury to us Malaysians because due to religion reasons, pork satay is not common in Malaysia. We happened to discover a stall selling good pork satay along a street near to 'Hatyai Green View Hotel'. Locating the stall was a little tricky for us but as long as you follow along 'Sangsri Rd' and find a clothing shop called 'Get Young', the satay stall is just in front of it. 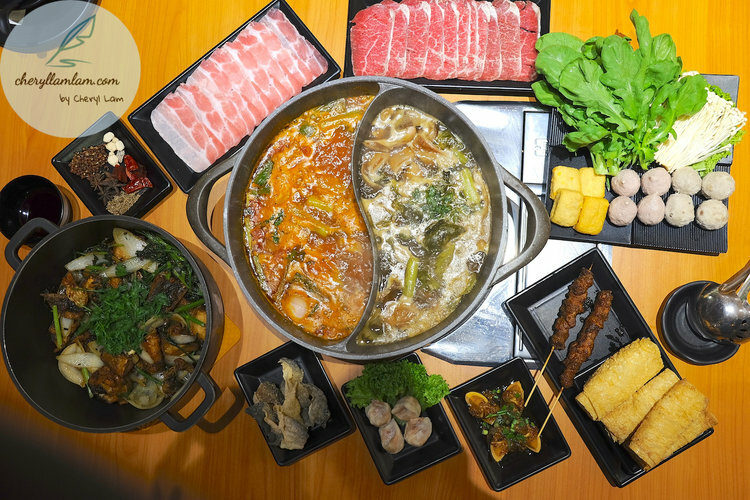 Mookata is a known as "Thai hot pot" which resembles a combination of Korean BBQ and Chinese hot pot. The center of the pot protudes which enables the meat to be grilled on top while other ingredients like fish balls or vegetables are cooked in soup. This dining concept is also getting popular throughout Malaysia and Singapore. The experience of Mookata buffet in Hatyai was indeed an eye opener. Other than having a huge selection of meat and seafood at the buffet line, the dining space could take up to 450 tables! Most importantly, it was only priced at THB289 per person. This is definitely a heaven for big eaters and Mookata lovers. Of course, wastage of food is not encouraged and there is a fine for every 100gram of food not finished so make sure you only take what you can finish. This restaurant is also located near to the famous tourist spot, Wine Village hence it often becomes a dinner place for those who visited Wine Village during the day. Address: 569, Supasarnrangsan Road, Amphoe Hatyai, Chang Wat Songkhla 90110, Thailand. Check out my 'Hatyai Food Journey' video below!